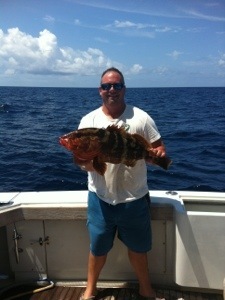 Joe pointed the Over Under out towards Columbus Point where we got into some bottom fishing. It was a super calm day and we drifted all day in 80-120 feet of water. 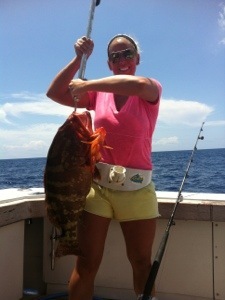 Jeff and Kim caught a bunch of groupers all throughout the day and Kim’s was the biggest, an 18 pound Nassau Grouper. The sharks are relentless here in Cat Island and they were no different while we were bottom fishing.